A 24-year-old man has admitted using his home to make explosives. 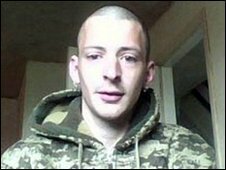 Darren Tinklin, of Blackwood in Caerphilly county, was a former member of a far-right organisation, Cardiff Crown Court was told. He appeared via video link to plead guilty to two charges of making explosives, including black powder and a pipe bomb, and possessing a firearm. The court heard Tinklin had not meant to cause injury and had made the explosives as an "experiment". A charge of possessing a document containing information "of a kind likely to be useful to a person committing or preparing an act of terrorism" was dropped. He was originally charged under the Terrorism Act and is being held in high security cells at Long Lartin prison in Worcestershire. The Recorder of Cardiff Nicholas Cooke said: "At one time he was a member of a far-right organisation. Though I understand that has ceased since, it is still relevant background." Tinklin was initially arrested by Gwent Police on suspicion of drugs offences at his home in October. The Metropolitan Police Service counter-terrorism command was later called in after further inquiries. Tinklin made no application for bail. Three other charges of making explosives were ordered to lie on file. The case was adjourned for reports and Tinklin will reappear for sentencing next month. He was remanded in custody to Long Lartin prison.